This here is the first book of the series, which I received shortly after reading and reviewing the fourth book in the series, OPERATION KILL IKE. Now, of course, things make a little more sense! In short, Lieutenant (er, Leftenant?) Crooke, VC, is given the task of tracking down a Brandenburger agent who is loose in Cairo, tasked with freeing a German-sympathizing Egyptian general and getting him into Axis-controlled Libya, where his presence on the side of the Axis forces will cause a schism in the Egyptian army and throw the British war effort into chaos. Crooke is picked for this mission because he is intimately familiar with the North African desert. Crooke was a LRDG (Long Range Desert Group) Lieutenant-Colonel until the disaster of Operation Flipper, where his LRDG men, tasked with guiding in the Commandos sent to kill Rommel, are caught and killed. Crooke was the only man in his unit to make it back to friendly lines, wounded in the left eye and nearly dead. Crooke punched out a superior officer when he was denied assignment back to the front, and busted back down to Second Lieutenant, where he languished until Mallory, a Naval Intelligence officer, picks him for this mission. Mallory believes that the Brandenburger agent is going to smuggle the Egyptian general out through the deep desert, and so Crooke is the natural choice for the mission. This is where, of course, things get a little silly. The author makes it clear that Crooke and the "glasshouse men" (read: soldiers in a military prison) he picks for the mission are the only manpower available to Mallory because all the other active-duty men are needed at the front. Of course, this is a mission of vital importance to the war effort as well. So really, while the need for a squad or two of highly trained and motivated men to assist Crooke on a mission which could alter the course of the war is clear, Crooke is forced to find, essentially, the worst of the worst. The men he picks are proficient, to be sure, but they're rogues and criminals, thieves and cowards. In no form of reality would such an important mission be assigned to this goon squad - rather, they'd just pull a squad from the front, since ten men here or there would make little difference in the overall health of the front. Regardless, this series was clearly written with the idea of piggy-backing on the success of The Dirty Dozen. The series was named "The Destroyers" in the UK, where it originated, but when published in the US, it was renamed "The Dirty Devils", and all references to the Destroyers in the text itself were altered for the American edition. And, of course, having a half-dozen scoundrels running amok in the deep desert is more interesting than a squad of bland, chipper fellows who're just doing their part for king and country. Overall, this was definitely an interesting read. The plot is a bit over-complicated, as the Brandenburger turns out to be a former German desert explorer now past his prime, who has a personal connection to the Egyptian general, and there's some oddball plot hooks that could probably have been left to the side in order to move the story along. However, there's a good deal of action throughout the book, and the desert adventure scenes - including a very memorable sandstorm - are very engaging. 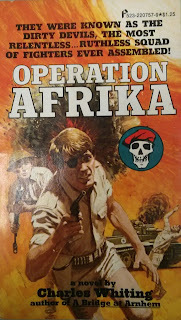 If you get a chance to pick up OPERATION AFRIKA for a few bucks from a used bookseller, and you enjoy pulpy British WW2 adventure fiction, this is a good series for you, especially since there's six books in the series, so it has some legs to it. The books may be a little hard to find, but with some digging, you should be able to land a copy. Since the first one I read by him wasn't terrible impressive, I've not read anymore.